December of 2006, I was attending a symposium in Salt Lake City, and had flown up with a friend, Marti, sharing a room in a local hotel. While in a sleeping state, I had a vision in which I was asleep but felt something gentle occasionally and momentarily press upon my body. After a few soft touches, I began to stir and rouse my self. Though my eyelids felt leaden, I struggled to open them. Looking around, I saw that I was lying in a bed in a room of many other beds, each occupied by a sleeping person. As I watched, little elf-like creatures silently yet joyfully ran around a walled center partition that had an opening near the ceiling. It was through this opening, on the other side, that I saw “Chris.” In rhythm, I would see his smiling face appear as he exuberantly bounced upon his (apparent) bed. Both he and the little men were tossing balloons at the sleeping individuals. Seeing this, I realized that that explained the soft touches that had awakened me. Though exhausted, I wanted to join in the game. With increasing desire, I wanted, really wanted… HAD TO… join these “little men” as one of THEIR team mates. As in the game of “Red Rover, Red Rover,” watching them for a few minutes and their deep fulfillment was “calling me over” to THEIR side. Exerting everything I had within me, I fully opened my eyes and sat up. Now, as I looked ahead at what had been the walled partition, its density had changed to that of a mere cheesecloth texture. I could completely see through to the entire room, whereas before I could mostly only see the half of the room where the sleeping individuals lie. Fighting sleep like a heavy drug, I put my feet on the floor and stood up. As I did so, I opened my eyes on “reality” and was standing up in the hotel room, fully awake with Marti drowsily looking at me from her bed. This vision is an amazing analogy of my life. In the twelve years since my experience, its prophecy has literally come to pass. Perhaps there are some who can read through the symbolism. In simplicity, it mirrors the LDS Temple Endowment, though Brigham Young ignorantly extricated the character “Adam’s” awakening at the end. I was reminded of the warning at the beginning of the LDS Temple Endowment which, basically, invites any would-be participate to leave if they are not willing to accept and abide by the greater knowledge that would be imparted. When given a choice to begin to gather conscious awareness of WHAT IS REALLY TRANSPIRING and the deep significance of each of one’s choices… OR … continue participating in the relatively UN-conscious state of mortality… does one continually hit the snooze button, or, like me, choose to become fully awake and consciously participating as quickly as possible? For those, like my dear friend I just quoted, who have left “the world” (Babylon), yet still cling to many facets of it, theirs is a continual battle. They are stuck in “no-man’s land;” a “cognitive dissonance” where the alarm clock is ringing, it’s one’s own “due time,” yet the desire for sleep overpowers their spirit. Yes, “the spirit is willing, yet the flesh is weak.” Which will triumph? As in the symbolic story of Moses, until fully desirous, one who has left the “world” yet has not fully entered into the state of empowered Gnosis may wander around and around and around (“40 years”) in a wilderness state until they have purified their desires and found their confidence to be allowed into a higher state of awareness where they may now bear sweet fruit. This is the current state of the earth’s inhabitants. Global warming is (purposefully) raising the vibratory state from one degree of intelligence into another. Those who are beginning to “wake up” and gain more consciousness (and its resultant conscience) are attempting to (more politely, perhaps) maneuver into a more suitable space. However, “someone’s been sleeping in my bed… and there she is!” There are, thus, “wars and rumors of wars.” Yet, to attempt to gain understanding while simultaneously “keeping the status quo” brings even greater inner conflict. One cannot fully be in two states at the same time. This is double-mindedness and each must “choose ye this day whom ye will serve.” As Jesus said, “I come, not to bring peace, but a sword.” “For I have come to set a man at variance with his father, and the daughter with her mother, and the daughter-in-law with her mother-in-law.” (Matthew 10: 35). Real Truth is intended to move us to a higher state of life, different relationships, clearer views, more conscientious and accurate choices that benefit the greater good instead of the individual alone. To try to remain in one’s former place upon the cosmic chessboard is to dam the entire game. What once may have been a “good enough” relationship now does not work. Former “correct choices” at one level are now just plain wrong. Yes… to remain stuck is hell. Contrary to a popular phrase: IGNORANCE is NOT bliss. Wisdom and Intelligence are Bliss. Remaining spiritually asleep or even ambivalent is to spurn the greater degrees of consciousness. Existing in the lower states of conscious awareness, one lacks understanding. At these lower consciousness levels (deep sleep), one continually adds to the moral demise of humanity. Ignorance (spiritual sleep) is the root of all fears, bringing judgment and mistakes in its wake. “We don’t like what we don’t understand, in fact, it scares us.” (From “Beauty and the Beast”) Fear and ambivalence, which derives from ignorance, is not a wise GPS. Fear closes the portal through which Intelligence flows. Thus, ignorance.. and ambivalence… cannot be bliss. Yet, subtly change that ignorance into open-hearted innocent awareness, and as you follow the wonder and curiosity of that plastic mind, you will gain knowledge. KNOWLEDGE is Power. And the knowledge worth truly knowing is the great secret of WHO ARE *YOU*? This “gnosis” (Knowing) is the Truth that shall set you free. Free from all guess-work. Free from all suffering. Free from misery and lack. Knowing yourself and living True to that precious voice within YOU guides you into Intelligence and Wisdom, taking you courageously through any shadowy fears by its steady spotlight. Gnosis brings Bliss and a power that can not be described by words. Yet, to acquire this KNOWING requires a journey into a higher vibration as one literally rearranges every belief, relationship, and choice and aligns one’s self Wholly into a higher dimension of awareness. While some wish to continue sleeping, thus, figuratively singing: “Eat, drink, and be merry, for tomorrow we die,” others are beginning to wake up and arise. For those wishing to remain ignorant, the “spiritual girls (or those who are young and without power), they “just wanna have fun!” Thus, dis-interest has weeded out the majority from expanding in consciousness. And now, I speak to each of you who read my words: “Know ye not that ye are all a part of the body of Christ?” “When two or more of you are gathered together, in my name, there will I be also.” WAKE UP!!! Leave… FULLY… Babylon. Extricate yourself from the relationships that bring you no joy and tether you to the relationships and cares of the world(ly). Leave the former ways of spiritual and emotional impotence and ignorance. Wake up and Walk Forward Spiritually. Live with Aliveness. Live with Power. BE a beacon of Hope. Let your LIGHT *SHINE. * Assist others to want to wake up to the sunshine! The mandatory books have been written. The “message” has been made available. Let the mailman go! His shift is over! Fully receive and read and apply the message. Let him relax. Take Up YOUR cross, and Make YOUR life worthwhile. APPLY the (pure) message! Do not let his life and message be in vain! So… leaving the transition state (wilderness), now what? If you have read each of the six L.O.V.E. posts I have written, then I would encourage You to consider measuring Your vibration. Where are You upon the scale of human consciousness? You must judge (measure) your self, but only with integrous sincerity can you deduce your honest state. Deceiving yourself is in no way helpful to your spiritual development. 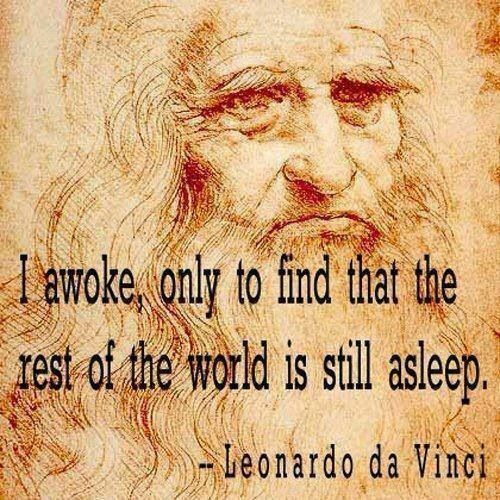 Truly, How awake have you become? You may want to re-read and deeply ponder my prior posts. You may also wish to read David Hawkins’ book “Power vs. Force” for his application of measuring your consciousness and soul growth. Wherever you currently are upon the “Stairway to Heaven,” as long as you are single-mindedly moving forward and upward, clinging to the “words of Christ,” in complete honesty with yourself, humbly willing to course correct and have your blind spots pointed out to you by the “eyes of Christ”… you can enter into the “Kingdom” this very day. With tenacity and integrity you can leave the fallen world behind and discover a state of True Peace and Understanding that defy description. Regardless of your current level of conscious calibration, apply the hints and applications I write about in my posts. Your transcendence will be glorious! 8: Eternity. 1: Union. This is the perfect date to join with me in Holy Matrimony, becoming ONE Body of Christ for Eternity. This is the New and Everlasting Covenant of Marriage. This is becoming The Sealed Portion. You have now been “called.” Will you choose your Self? I hope so. Let me know. Creating Your Life From the INSIDE Out. Quantum Creation.